what happened in The Iron Trial? Call survives a massacre during the Third Mage War. He’s just a baby. His mother died, but before doing so she wrote “Kill the child” in the ice. Because that’s not worrying at all. Now in present day, Call is living with his father. 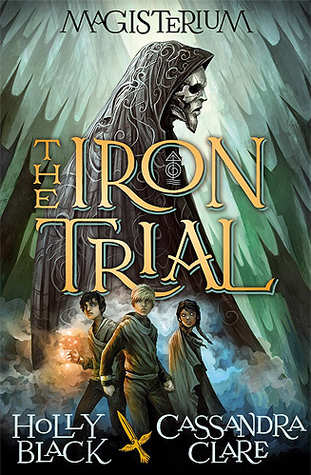 Call is to take a test to get into The Magisterium, a school for mages. His dad tells him to fail it on purpose because he doesn’t like magic. Unfortunately for him, Call gets through. Master Rufus takes Call on as an apprentice. Call goes to live at the school and makes a few friends. Master Rufus says he senses anger in Call (literally, Yoda) and he wants to help him control it and his power. Call, Aaron, and Tamara have to separate sand into piles. Fun. The students have to fight a wyvern as part of their training. Call sneaks into Master Rufus’ office and finds a note from his father. In the note, his father asks Master Rufus to bind Call’s magic. Call gets upset. Call hears people talking about an enemy who’s gaining power. The group has to search some caves and fill a bowl up in the Butterfly Pool. They bump into a Devoured, which tells them it sees their future. “One of you will fail. One of you will die. And one of you is already dead.” Again, creepy. The students go and look for a missing student, along with the teachers. Aaron protects Call from wolves using a powerful smoke. This means Aaron is the Makar which will defeat The Enemy. Call adopts a wolf cub and calls him Havoc. Adorable. Aaron tells Call that he’s nervous about his new responsibilities. Aaron goes missing. Havoc picks up on his scent and leads the group to an abandoned building. They find Aaron hanging from the ceiling with the missing student, Drew, watching him. A creepy man appears (it’s Master Joseph but in a mask). He calls Call his master and asks whether he should kill an injured Drew or not. It turns out that Master Joseph thinks Call is the Enemy. Master Joseph says the real Call died as a baby during the massacre, and The Enemy’s soul is now possessing his body. The Enemy is called Constantine Madden. Call threatens to report this whole thing to Master Rufus, and Master Joseph threatens to kill him or bind his magic, or make him lose his friends. Aaron and Tamara save Call from Master Joseph and the creatures and the group escapes and returns to school. Call decides not to tell anyone what happened with Master Joseph. He suspects his father knows the truth about him, though. The year ends, and the students pass through the Gate of Control and become Official MagesTM.